20 cm 184 p. : ill.
"Sometimes funny, always creepy, genuinely moving, this marvellous spine-chiller will appeal to readers from nine to ninety." - "Books for Keeps". "I was looking forward to "Coraline", and I wasn't disappointed. In fact, I was enthralled. This is a marvellously strange and scary book." - Philip Pullman, "Guardian". "If any writer can get the guys to read about the girls, it should be Neil Gaiman. His new novel "Coraline" is a dreamlike adventure. For all its gripping nightmare imagery, this is actually a conventional fairy story with a moral." - "Daily Telegraph". 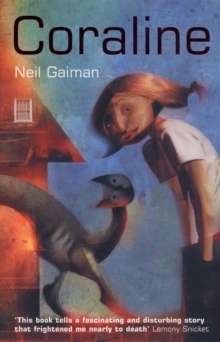 Stephen King once called Neil Gaiman 'a treasure-house of stories' and, in this wonderful novel, which has been likened to both "Alice in Wonderland" and the "Narnia Chronicles", we get to see Neil at his storytelling best.